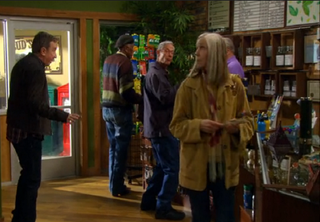 A couple of months ago in the embedded post, I said that I expected the pot store owned by the grandfather on Last Man Standing to be an occasional part of the show. Friday, it reappeared and though not elaborate, we saw a set and the business was called a success. It's also worth noting that all the customers were senior citizens and the jokes underlined their age. The store is a respectable joint. ETA: Tim popped into his father's office for another scene on the 11th and he again referred to himself as the "marketing guy" for his dad's store. Though none of the characters are smoking it, there is now legal and normalized weed on ABC, Friday nights. Kudos!